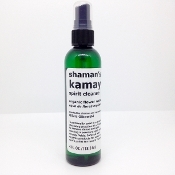 Shaman's Kamay Organic Clearing Spray. Traditionally used in a shamanic cleansing practice of a “limpia”, to remove dense energies clearing a person’s spirit and energy fields. Infused with organic products for ease on one’s pallet for mouth “Kamay”. By spraying with Shaman’s Kamay over the energy field of a person, it repairs free-radicals and uplifts the energetic bodies to drop away the denser energies that may be attached to a person or space. Shamans use a small bit in their mouth as a “kamay", spray above/over the body in a fine mist. Use spray bottle to mist over a person/self, making sure the subjects eyes are closed. Can use to cleanse a room, or spray to brighten your crystals energy. Ingredients: Distilled Zero filtered water, organic vodka (used as a preservative), certified organic Nature’s Oil: lavender, orange, cinnamon, and a proprietary blend of other organic essences. ©OhOlivia, Olivia Olkowski 2018. All rights reserved.